Kharcho is a traditional Georgian soup containing meat, rice, vegetables and a highly spiced bouillon. The soup is usually served with finely chopped herbs. 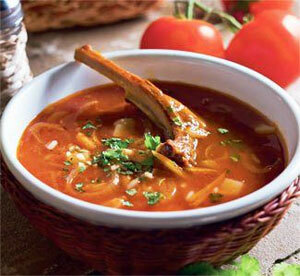 The characteristic ingredients of the soup are sun-dried plum purée (tkemali) and grated walnuts. Here is the traditional georgian recipe for Kharcho: Cut a cleaned, thoroughly washed fat hen into pieces, put it into a sauce-pan, add shredded onions, close the cover and place the pan on fire. Stew till the onions turn brown, then cover the pieces with boiling water and put peeled finely shredded tomatoes. Pound walnuts, garlic, dry and fresh coriander, pepper, saffron in a mortar and put them into a small bowl. Gradually add broth using a table-spoon and thoroughly stir the mass. Pour the mass into the pan and boil till the hen is ready. Add salt and taste.